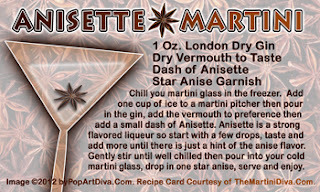 and this ANISETTE MARTINI is a Star of Anise Cocktails! Anise (Pimpinella anisum) is a spice that is very reminiscent of licorice. Star Anise (Illicium verum) closely resembles Anise in flavor but is not actually Anise. Both have a licorice flavor to them. If you've ever had Galliano, Sambuca, Pastis or Absinthe you will be somewhat familiar with the flavors of Anise aka Aniseed or Star Anise as one of these has been used to flavor those liqueurs. 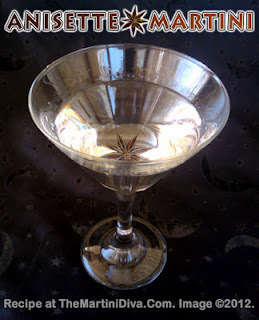 Of course, another liqueur that is flavored with Anise or Star Anise is Anisette and that is the "star" of my Anisette Martini for National Anisette Day!